Fans of modern video slots with lavish visuals, and slick animation will probably enjoy Frankenslot’s Monster from BetSoft. The company have become industry leaders for their impressive imagery and creative team. For this one, we join Frankenslot as he attempts to charge up his monster. Clearly the game draws heavily on the nineteenth century Mary Shelley novel, Frankenstein. As well as being visually impressive, Frankenslot’s Monster offers some great additional gameplay features which keep the action varied. Whilst these are not quite as engaging as some of BetSoft’s other offerings (Dr Jekyll and Mr Hyde, for example), they do provide for an enjoyable slot experience. Strong visuals and animation throughout. BetSoft obviously have some fantastic artists on their team, and Frankenslot’s Monster showcases their talents superbly. Fun and potentially lucrative bonus features. Free spins modes are always great and the bonus round looks fantastic and really complements the theme of the title. Low upper betting limit. This criticism is levelled at almost all BetSoft’s games. Most players won’t find it too much of an issue however. The highest rollers may be put off by the lower than average betting limit of £150. “Wild” symbol = 1,000x the line bet. The monster = 500x the line bet. Dr Frankenslot = 400x the line bet. Full moon = 300x the line bet. Eyeball jar = 200x the line bet. Frankenstein’s electronic device = 150x the line bet. *Payouts increase if more bets per payline are added. Landing three “scatter” symbols anywhere on the reels awards players with eight free spins. 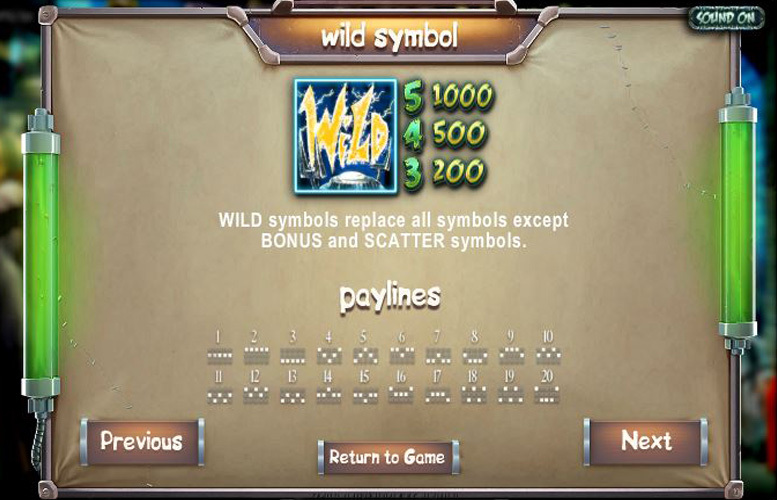 During every spin, between one and three random symbols will turn “wild” on the reels before any pay-outs are calculated. These “wilds” can substitute for any symbol other than the “scatter”. 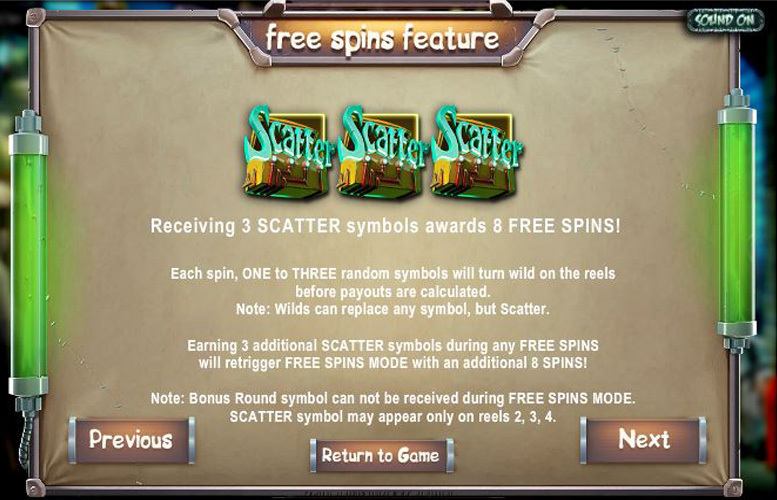 During the free spins, if players are fortunate enough to land an additional three “scatter” symbols, they’ll re-trigger the free spin mode, receiving an additional eight spins. 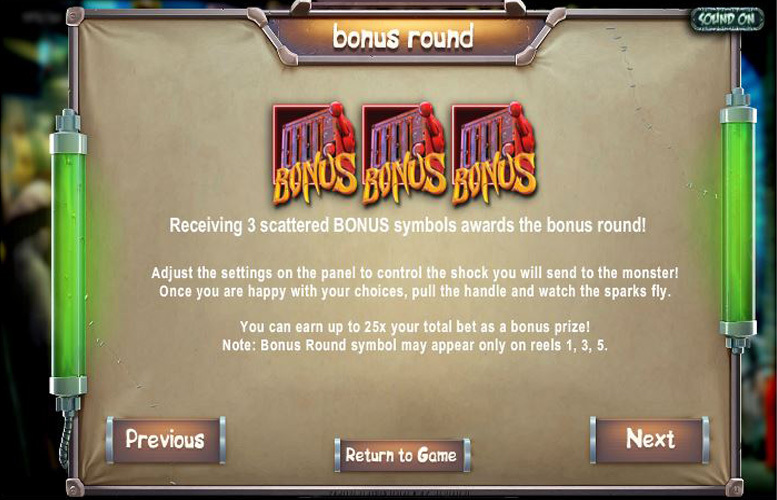 Receiving three “bonus” symbols anywhere on the reels will award the bonus round. Players can adjust the settings on the panel to control the shock they send to Frankenstein’s monster. Then, they must pull the handle to charge the beast! During this side game, there’s up to 25x the total bet up for grabs. After any spin, players may elect to double their winnings. Clicking on the “Double Up” button next to the “spin” control will take them to a coin toss side game. Here, they must choose to bet all or 50% of their winnings on a double or nothing toss. If they guess right they’ll be paid in accordance with the stake size option they selected. If they guess wrong, they’ll forfeit the percentage of winnings wagered. More double ups can be made until players collect or run out of winnings to bet. 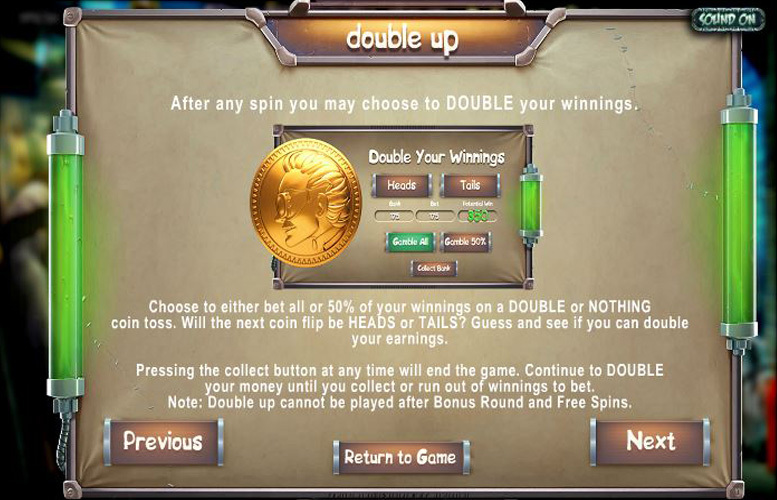 Players should note that the “double up” feature cannot be played after the bonus round, or free spin feature. King = 80x the line bet. 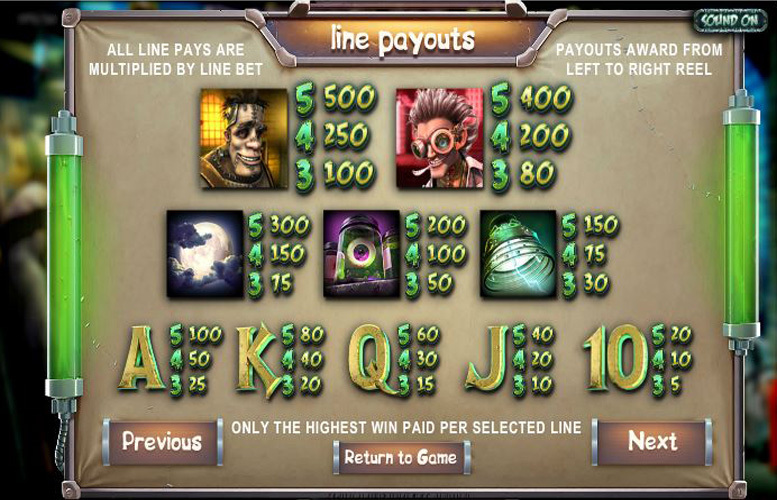 The number of win lines is fixed on Frankenslot’s Monster. Players must use all 20 on every spin. They can however, adjust the number of coins bet per line, and the value of each one. The highest and lowest coin values are £1, and 2p respectively and the bets per line range from one to five. This means, with all values set to the minimum, the lowest possible bet per spin is 40p, and the highest is just £100. Whilst many players will find this more than adequate, this low upper betting limit will certainly put some of the highest rollers off Frankenslot’s Monster. 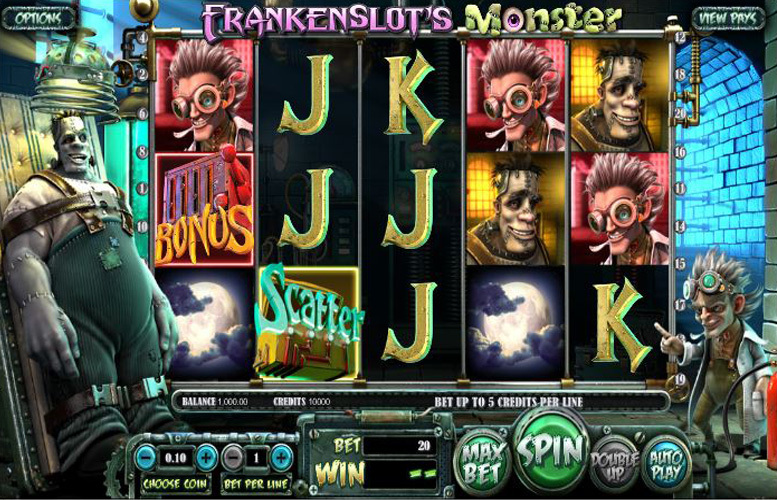 Frankenslot’s Monster is a great game that has some enjoyable features and an iconic art style. Whilst it doesn’t quite compare to the likes of Dr Jekyll and Mr Hyde, or A Christmas Carol from BetSoft, it’s very much worth a play. If you’re a fan of Mary Shelley, or even if you just like thoughtful, well-designed slot machines, you might just love this title. All that said, there are a few drawbacks. The lack of creativity in designing special symbols is one. It seems like a small ask for the designers to include something a bit more than a “wild” or “scatter” label on the game’s most important symbols. Then there’s the low betting limit. This is common with all BetSoft games it seems. Therefore, we’re not particularly surprised by this, although it’s worth pointing out. This game has a rating of 4 / 5 with 538 total reviews by the users.